Our Birthday bouncer is a delicious feast for the eyes. 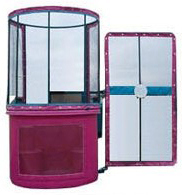 This unit is extremely popular with kids and parents! The colorful air brushed Birthday balloons finish off this master piece. M-I-C...K-E-Y...-M-O-U-S-E!! Kids and grown-ups of all ages love Mickey Mouse! Join Mickey and friends and have a blast in this beautifully colored, digitally printed moonwalk that's sure to please. 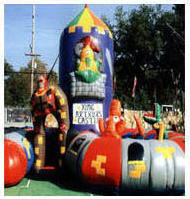 Filled with obstacles and friendly inflated creatures. This enchanted crawl through maze is great for toddlers. 12 feet High Slide into a small holding pond. 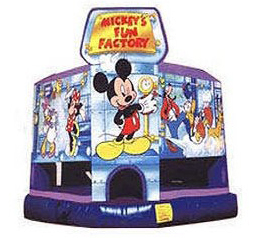 Add something exciting and fun to your next party with our Dunk Tank! Race your friends to the end of this exciting new unit while jumping over hurdles and crawling through tunnels. Everyone On Board The Train! 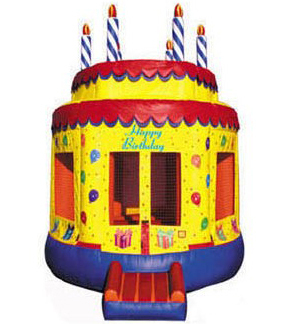 Kids ages 2-5 will have a great time climbing over and through the obstacles inside this super fun train. 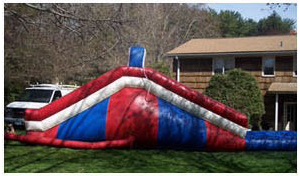 The Happy Bounce will provide hours of smiles and enjoyment to children of all ages.